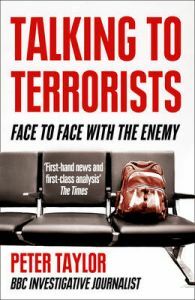 A controversial and important book by BBC reporter and terrorism expert Peter Taylor. Newly updated to mark the tenth anniversary of 9/11 and to include the death of Osama Bin Laden. During his 40-year career, award-winning journalist Peter Taylor has come face-to-face with some of the world's most notorious terrorists. In 1972 he was sent to Northern Ireland to report on 'Bloody Sunday' and in the aftermath of 9/11, he focused on Al Qaeda, breaking stories in the period up to the July bombings and the plot to blow up passenger planes mid-Atlantic. In Talking to Terrorists Taylor wrestles with a range of complex questions: What are terrorists like? What motivates them? Should governments talk to them? When does interrogation become torture? In this journey from Northern Ireland's Bogside to the notorious Guantanamo Bay, he uncovers this deadly phenomenon, unavoidably at the centre of our lives. Newly updated to mark the tenth anniversary of 9/11, and in the aftermath of the death of Osama Bin Laden, Talking to Terrorists is controversial, revelatory and an unquestionably important book for our times. Peter Taylor is a highly respected BBC investigative journalist who has reported on terrorism for over 35 years. He began his career covering Bloody Sunday, and his Troubles trilogy - 'Provos', 'Loyalists' and 'Brits' - is considered to be the definitive account of the conflict. Following peace in Northern Ireland his focus switched to the new security threat posed by Al Qaeda and he has since presented three television series on the Islamic terror threat: 'The New Al-Qaeda', 'The Age of Terror' and 'Generation Jihad'. In 2002 he received an OBE for services to broadcasting, and in 2008 he was awarded the highly prestigious James Cameron Memorial Prize 'for work as a journalist that combined moral vision and professional integrity'.